WRAITH was performed at Links Hall Constellation as part of "Thresholds Divine" an evening of performances featuring Caleb Yono, Burning Orchid (Efren Arcoiris, Rose Hernandez) and Feldspar, curated by Jonny Sommer. WRAITH- a ghost or ghostlike image of someone, especially one seen shortly before or after their death. 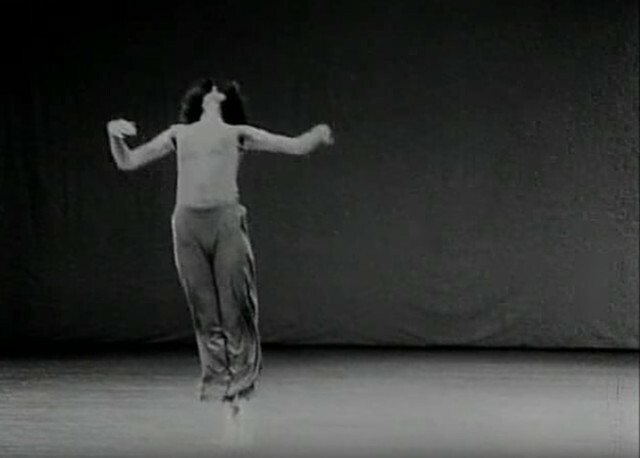 I had been researching Trisha Brown at the time of her death. I was interested in how her dances appeared improvised while being specifically choreographed. I was interested in how her work is a dissolved binary between expression and control. To watch Trisha Brown perform her own work is to see a woman filled with power. I wanted to learn from her archive. WRAITH was a reenactment of the dance film of Brown's dance "Watermotor" by Babette Mangolte (1978) I wanted to both learn the dance and recreate the look of the document. Trisha Brown's wild hair masking her face her athletic leaps and queer attention to detail, her movements carving into time a joy and grace. During the performance I utilized a consumer security camera to simultaneously record and project my movement into the performance space. Video Valence created a 10 to 20 second delay between action and its projection behind me.